On June 16, 2015, Jonathan Greenberg addressed the County Supervisors during public comment about the the library crisis. To the surprise of those present, the Supervisors were eager to speak in a solution-oriented way about solving this county-wide issue. Below is the transcript of first Jonathan’s comment, followed by Susan Gorin, Veronica Ferguson, David Rabbitt, and Shirley Zane. 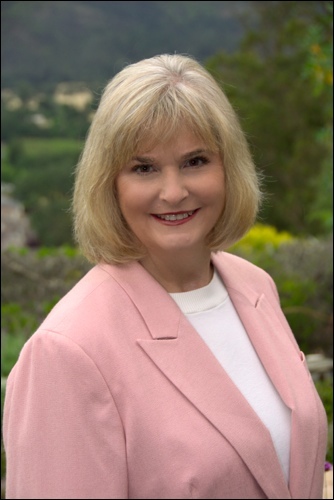 A video with the June 16, 2015 public presentation of the petition, along with an excerpt of the Sonoma Independent’s public comment, and the response, transcribed below, of Board Chair Susan Gorin and Supervisor Shirlee Zane can be viewed here. This disconnect is that (the library) is not part of what you do as our elected representatives—this is not a part of what we have as taxpayers. This is special side thing, almost like a private business sitting somewhere. And that has been consistent with the response that I have heard and that we have heard from this Board of Supervisors. There is a disconnect between what people have expressed they want and what you have done and really not done.. You’ve been elected to oversee the budget. 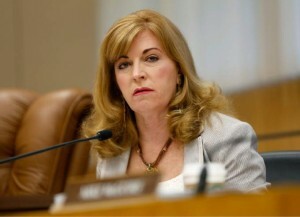 You are the only entity that could lead an effort to restore these library services and I am here to call you on that. “Thank you Jonathan. I think, and the response that we’ve been giving to all the folks that contact our offices, I don’t interpret the last vote for libraries as people don’t support libraries. In fact, I interpret it: look at how many people do support libraries. And I think it has been pretty clear that this board has been very responsive to that, to even paying for that measure to be put in the ballot last fall (Measure M) and we all expressed a support for the libraries. 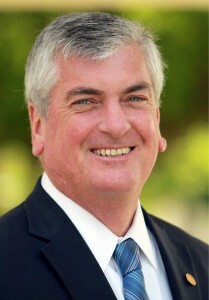 But we’ve also worked with former Supervisor McGuire (Mike McGuire) and CAO Ferguson (County Administrator Veronica Ferguson) to develop the new JPA (Joint Powers Agreement) and appoint new representatives on the part of a number of cities—all of our cities in the county—as well as the county representatives to the library commission. And I think that it’s really important that we acknowledge to the library commission how important our libraries are, but the conversation needs to start with that. And they need to look at the financing for libraries and have this conversation with all of our city partners as well as the county. I think you will find support from the board of supervisors to be actively engaged in the conversation about what more we can do to support our libraries. But I think it’s pretty clear from my perspective that the conversation needs to start with the library commission. CAO Ferguson, anything you want to add to that? County Administrator Veronica Ferguson: Uh, no, I think you captured that well, which is your board entered into a JPA that created a commission that is responsible for running the libraries, and that’s actually where the conversation should begin. Thank you very much, I appreciate this discussion. I do think that—I agree with you. It’s obviously not the county’s responsibility alone, it is the JPA. I believe the county has played a role. In fact, last year we sponsored the ballot initiative which is no small task. I think 250,000 dollars, a quarter of a million dollars, to put that ballot initiative out there that was not reimbursed to the county and the county did not have to do that out of their own accord. I do think that the conversation needs to start at library commission, I’d talk to the county administrator about—I know it’s not on the county agenda… how we can work between the capital improvement projects and the operation and the restoration of Monday hours. I am always looking into everything proportional but the library’s not the county’s responsibility alone, but all the cities out there that have branches within their jurisdictions. And we should limit our comments, this item is not on the agenda. As somebody who represents two of the probably—I think—the most active libraries in terms of business, which is the downtown library, which I have used many times for the last 25 years, and Coddingtown branches. You know it’s a JPA—Joint Powers Agreement—that means it’s represented by cities and the County and my colleagues are absolutely right, everybody needs to come to the table. There is a (Library) Commission, that’s where it begins. And the City of Santa Rosa obviously has a huge investment there in terms of those two branches and so we all need to come forward if we want to extend the hours. But expansion into areas that have great disparity—going back to the portrait of Sonoma County—is (also) very, very important. We don’t have a library in southwest Santa Rosa. We need to build one. Period. 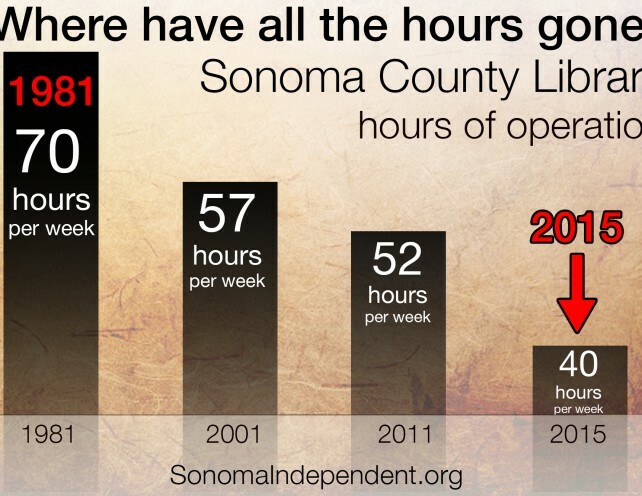 Click here to read The Sonoma Independent’s Interim Financing Plan to Restore Library Hours. Tell your City Council members, Supervisor and Library Commission representatives that you support this plan by signing the full petition here, or on the right of this page. I’ve seen this coming. The problem is the people. As an English teacher I’ve watch read/ writing drop. The vast majority are illiterate and that includes college graduates, with advanced degrees.